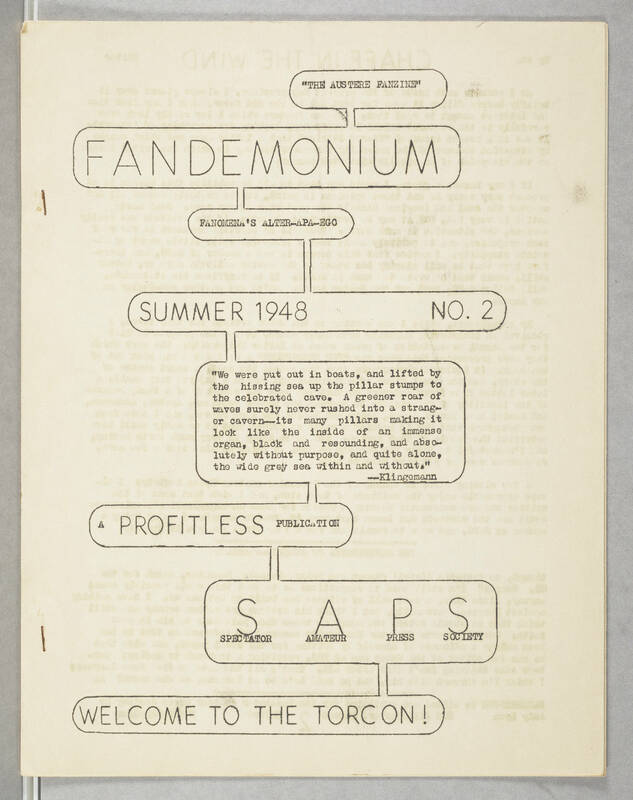 "THE AUSTERE FANZINE" FANDEMONIUM FANOMENA'S ALTER-APA-EGO SUMMER 1948 NO. 2 "We were put out in boats, and lifted by the hissing sea up the pillar stumps to the celebrated cave. A greener roar of waves surely never rushed into a stranger cavern -- its many pillars making it look like the inside of an immense organ, black and resounding, and absolutely without purpose, and quite alone, the wide grey sea within and without." --Klingemann A PROFITLESS PUBLICATION S A P S SPECTATOR AMATEUR PRESS SOCIETY WELCOME TO THE TORCON!